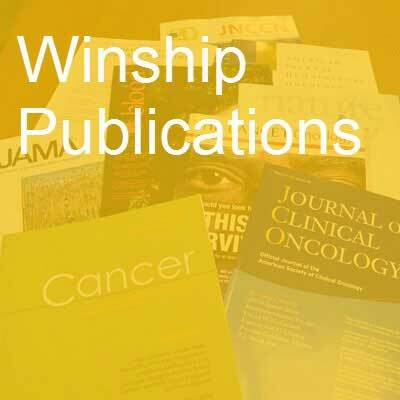 Various first authors and senior authors from Winship Cancer Institute have published 41 studies in major medical and scientific journals in the past month. Deferred therapy is associated with improved overall survival in patients with newly diagnosed mantle cell lymphoma. Cohen JB, Han X, Jemal A, Ward EM, Flowers CR. Cancer. 2016; 122(15):2356-2363. PubMed PMID: 27153197. Metabolic Pathways and Networks Associated With Tobacco Use in Military Personnel. Jones DP, Walker DI, Uppal K, Rohrbeck P, Mallon CT, Go YM. Journal of occupational and environmental medicine / American College of Occupational and Environmental Medicine. 2016; 58(8 Suppl 1):S111-6. PubMed PMID: 27501098; PubMed Central PMCID: PMC4978145. The Society of Thoracic Surgeons Lung Cancer Resection Risk Model: Higher Quality Data and Superior Outcomes. Fernandez FG, Kosinski AS, Burfeind W, Park B, DeCamp MM, Seder C, Marshall B, Magee MJ, Wright CD, Kozower BD. The Annals of thoracic surgery. 2016; 102(2):370-7. PubMed PMID: 27209606; PubMed Central PMCID: PMC5016798. Remembrance of Professor Steven Wechsler (1948-2016). Ahmed R, Fraser NW, Ghiasi H, Jones C. Journal of neurovirology. 2016; PubMed PMID: 27491501. Update on elotuzumab, a novel anti-SLAMF7 monoclonal antibody for the treatment of multiple myeloma. Lonial S, Kaufman J, Reece D, Mateos MV, Laubach J, Richardson P. Expert opinion on biological therapy. 2016; :1-11. PubMed PMID: 27533882. Perspectives on the impact of storage duration on blood quality and transfusion outcomes. Roback JD. Vox sanguinis. 2016; PubMed PMID: 27552072. Inflammation Effects on Motivation and Motor Activity: Role of Dopamine. Felger JC, Treadway MT. Neuropsychopharmacology : official publication of the American College of Neuropsychopharmacology. 2016; PubMed PMID: 27480574. Therapeutic Implications of Brain-Immune Interactions: Treatment in Translation. Miller AH, Haroon E, Felger JC. Neuropsychopharmacology : official publication of the American College of Neuropsychopharmacology. 2016; PubMed PMID: 27555382. A Conserved Nuclear Cyclophilin Is Required for Both RNA Polymerase II Elongation and Co-transcriptional Splicing in Caenorhabditis elegans. Ahn JH, Rechsteiner A, Strome S, Kelly WG. PLoS genetics. 2016; 12(8):e1006227. PubMed PMID: 27541139; PubMed Central PMCID: PMC4991786. Association of Socioeconomic Status and Race/Ethnicity With Treatment and Survival in Patients With Medullary Thyroid Cancer. Roche AM, Fedewa SA, Chen AY. JAMA otolaryngology-- head & neck surgery. 2016; 142(8):763-771. PubMed PMID: 27254481. Deployment-Associated Exposure Surveillance With High-Resolution Metabolomics. Walker DI, Mallon CT, Hopke PK, Uppal K, Go YM, Rohrbeck P, Pennell KD, Jones DP. Journal of occupational and environmental medicine / American College of Occupational and Environmental Medicine. 2016; 58(8 Suppl 1):S12-21. PubMed PMID: 27501099; PubMed Central PMCID: PMC4978191. High-Resolution Metabolomics Assessment of Military Personnel: Evaluating Analytical Strategies for Chemical Detection. Liu KH, Walker DI, Uppal K, Tran V, Rohrbeck P, Mallon TM, Jones DP. Journal of occupational and environmental medicine / American College of Occupational and Environmental Medicine. 2016; 58(8 Suppl 1):S53-61. PubMed PMID: 27501105; PubMed Central PMCID: PMC4978147. High-Resolution Metabolomics for Nutrition and Health Assessment of Armed Forces Personnel. Accardi CJ, Walker DI, Uppal K, Quyyumi AA, Rohrbeck P, Pennell KD, Mallon CT, Jones DP. Journal of occupational and environmental medicine / American College of Occupational and Environmental Medicine. 2016; 58(8S Suppl 1):S80-S88. PubMed PMID: 27501108. In Memoriam-Hank Edelhauser (1937-2015). Dawson DG, Glasser DB, Grossniklaus HE. Cornea. 2016; 35(8):1033-1034. PubMed PMID: 27391091. Inflammatory markers are associated with decreased psychomotor speed in patients with major depressive disorder. Goldsmith DR, Haroon E, Woolwine BJ, Jung MY, Wommack EC, Harvey PD, Treadway MT, Felger JC, Miller AH. Brain, behavior, and immunity. 2016; 56:281-8. PubMed PMID: 27040122; PubMed Central PMCID: PMC4939278. Is Maintenance Therapy for Everyone? Nooka AK, Lonial S. Clinical lymphoma, myeloma & leukemia. 2016; 16S:S139-S144. PubMed PMID: 27521311. Location, Location, Location: The Reality of Tumor Real Estate and Nodal Upstaging. Medbery RL, Fernandez FG. Journal of thoracic oncology : official publication of the International Association for the Study of Lung Cancer. 2016; 11(8):e104. PubMed PMID: 27453166. Modeled Perfluorooctanoic Acid (PFOA) Exposure and Liver Function in a Mid-Ohio Valley Community. Darrow LA, Groth AC, Winquist A, Shin HM, Bartell SM, Steenland K. Environmental health perspectives. 2016; 124(8):1227-33. PubMed PMID: 26978841; PubMed Central PMCID: PMC4977053. No association between mitochondrial DNA copy number and colorectal adenomas. Thyagarajan B, Guan W, Fedirko V, Barcelo H, Tu H, Gross M, Goodman M, Bostick RM. Molecular carcinogenesis. 2016; 55(8):1290-1296. PubMed PMID: 26258394. When Should a Patient Be Declared Recovered From a Major Depressive Episode? Dunlop BW, Rapaport MH. The Journal of clinical psychiatry. 2016; 77(8):e1026-8. PubMed PMID: 27561150. Editorial introduction: The effects of somatic disease and environmental insults on the stress response. Neigh GN, Felger JC. Physiology & behavior. 2016; PubMed PMID: 27498283. Prioritizing individual genetic variants after kernel machine testing using variable selection. He Q, Cai T, Liu Y, Zhao N, Harmon QE, Almli LM, Binder EB, Engel SM, Ressler KJ, Conneely KN, Lin X, Wu MC. Genetic epidemiology. 2016; PubMed PMID: 27488097. Stimulation of natural killer cell-mediated tumor immunity by an IL-15/TGF-ÃŸ neutralizing fusion protein. Ng S, Deng J, Chinnadurai R, Yuan S, Pennati A, Galipeau J. Cancer research. 2016; PubMed PMID: 27488533. Radiation plus Chemotherapy in Low-Grade Glioma. Buckner JC, Chakravarti A, Curran Jr WJ. The New England journal of medicine. 2016; 375(5):490-1. PubMed PMID: 27518677. Preventing and Managing Toxicities of High-Dose Methotrexate. Howard SC, McCormick J, Pui CH, Buddington RK, Harvey RD. The oncologist. 2016; PubMed PMID: 27496039. Phase I trial of dose-escalating metronomic temozolomide plus bevacizumab and bortezomib for patients with recurrent glioblastoma. McCracken DJ, Celano EC, Voloschin AD, Read WL, Olson JJ. Journal of neuro-oncology. 2016; PubMed PMID: 27502784. Risk and impact of pulmonary complications in survivors of childhood cancer: A report from the Childhood Cancer Survivor Study. Dietz AC, Chen Y, Yasui Y, Ness KK, Hagood JS, Chow EJ, Stovall M, Neglia JP, Oeffinger KC, Mertens AC, Robison LL, Armstrong GT, Mulrooney DA. Cancer. 2016; PubMed PMID: 27504874. Validation and Banding of the ItchyQuant, A Self-Report Itch Severity Scale. Haydek CG, Love E, Mollanazar NK, Valdes Rodriguez R, Lee H, Yosipovitch G, Tharp MD, Hanifin JM, Chen KH, Chen SC. The Journal of investigative dermatology. 2016; PubMed PMID: 27521593. YB-1 is elevated in medulloblastoma and drives proliferation in Sonic hedgehog-dependent cerebellar granule neuron progenitor cells and medulloblastoma cells. Dey A, Robitaille M, Remke M, Maier C, Malhotra A, Gregorieff A, Wrana JL, Taylor MD, Angers S, Kenney AM. Oncogene. 2016; 35(32):4256-68. PubMed PMID: 26725322; PubMed Central PMCID: PMC4931992. Author Reply. Broggi MS, Patil D, Baum Y, Nieh PT, Alemozaffar M, Pattaras JG, Ogan K, Master VA. Urology. 2016; PubMed PMID: 27539917. Precision, accuracy, and resolution-Dose selection of oral anticancer agents. Beardslee TJ, Harvey RD. Cancer. 2016; PubMed PMID: 27526184. A Study of Reverse Causation: Examining the Associations of Perfluorooctanoic Acid Serum Levels with Two Outcomes. Dhingra R, Winquist A, Darrow LA, Klein M, Steenland K. Environmental health perspectives. 2016; PubMed PMID: 27529882. Parental Perception of Neighborhood Safety and Children's Physical Activity. Galaviz K, Zytnick D, Cunningham SA, Kegler MC. Journal of physical activity & health. 2016; :1-19. PubMed PMID: 27254849. Population-Attributable Risk Percentages for Racialized Risk Environments. Cooper HL, Arriola KJ, HaardÃ¶rfer R, McBride CM. American journal of public health. 2016; :e1-e4. PubMed PMID: 27552263. Metabolic pathways of lung inflammation revealed by high-resolution metabolomics (HRM) of H1N1 influenza virus infection in mice. Chandler JD, Hu X, Ko EJ, Park S, Lee YT, Orr ML, Fernandes J, Uppal K, Kang SM, Jones DP, Go YM. American journal of physiology. Regulatory, integrative and comparative physiology. 2016; :ajpregu.00298.2016. PubMed PMID: 27558316. The Polyadenosine RNA Binding Protein, Zinc Finger Cys3His Protein #14 (ZC3H14), Regulates the pre-mRNA Processing of a Key ATP Synthase Subunit mRNA. Wigington CP, Morris KJ, Newman LE, Corbett AH. The Journal of biological chemistry. 2016; PubMed PMID: 27563065. EGFR and C/EBP-Î² oncogenic signaling is bidirectional in human glioma and varies with the C/EBP-Î² isoform. Selagea L, Mishra A, Anand M, Ross J, Tucker-Burden C, Kong J, Brat DJ. FASEB journal : official publication of the Federation of American Societies for Experimental Biology. 2016; PubMed PMID: 27572958. Expression of death receptor 4 is positively regulated by MEK/ERK/AP-1 signaling and suppressed upon MEK inhibition. Yao W, Oh YT, Deng J, Yue P, Deng L, Huang H, Zhou W, Sun SY. The Journal of biological chemistry. 2016; PubMed PMID: 27576686.